Collaboration software has become a staple for businesses small and large that have to keep teamwork and communications flowing efficiently. The problem is that there are so many options to choose from; in fact, the Wikipedia page on the subject lists over 175 different collaborative software options. Each program ranges in the solutions it offers, the price, and the user-friendliness. With such a dizzying array of choices, it can be hard for small business owners to know what software will work best in their business. A brand new option on the market is Intraboom. Just released this year, it is so new that it hasn’t even been added to the Wikipedia list yet. Intraboom has entered a crowded market (to say the least!) However, their unique selling proposition (USP) is that, unlike other collaboration software, they offer a simple “one and done” solution with everything a small business will need. A dashboard where you can keep everything organized and follow all group activities. A bulletin board to post group messages. A calendar to keep the group informed about each person’s schedule. A task list to organize tasks and stay on top of due dates. Real-time file sharing with group members. A gallery for photos and videos which team members can share and comment on. A contact list where all group and team contact information can be stored. A discussion board where people can discuss projects and give feedback. Messaging systems, including online chat, private messaging and even a system where you can send text messages to mobile phones. Intraboom offers a free version for up to 5 groups, up to 10 members per group and up to 5 GB of disk space. There are also monthly plans. Check out how @Intraboom is making communication within the #biz easy! I first learned about Intraboom at SXSW 2016. 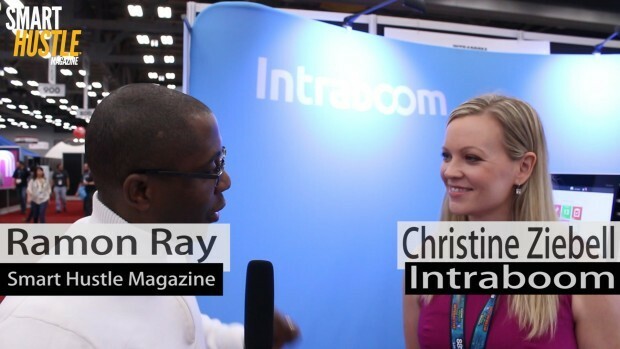 During the event, I conducted a short interview with Christine Ziebell, the founder and CEO of Intraboom. To learn more about this powerful new collaboration software, click play to listen to the interview below. It is an all-in-one system. As you can see above, it offers pretty much anything your small business will need for collaboration and communication. Easy to use. Christine says she likes to call it the ‘for dummies’ version of collaboration software. It is super intuitive, requires no training, and you can master the program in no time. Drives up employee engagement. Businesses who are currently using Intraboom say that it makes employees more engaged and more productive. Intraboom has entered a crowded market, for sure, but they’ve done so in a thoughtful way – distinguishing how they are different from the competition and addressing the primary customer pain points regarding collaboration software. Intraboom’s strategy is a model for all businesses who are planning to enter a competitive industry – and Intraboom itself may also be a tool to help you get there.